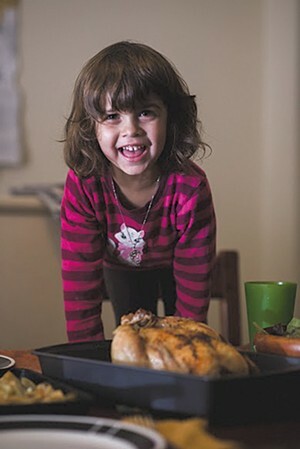 Maple-Roasted Chicken | Mealtime | Kids VT - small people, big ideas! Seven years ago, celebrity chef Jamie Oliver convinced me to buy and cook a whole chicken. A former vegetarian, I felt strongly that if I was going to continue life as a meat eater, this was a skill I had to learn. Reading the laid-back and reassuring instructions in Oliver's book, Jamie's Dinners, gave me the confidence to take on the process — even though raw meat still made me squeamish. I marched into Hannaford, determined. But when I picked up the shrink-wrapped bird, I shuddered. It was heavy, kind of floppy and still recognizable as the animal it had been. I frowned at it for a moment, then steeled myself and put it in the cart. At home, I set to work. I removed the bird from its plastic casing, took a deep breath, poked my hand into the chicken and found — to my relief — that the organs were sealed inside a bag, which I pulled out. Next, I rubbed the bird inside and out with kosher salt and olive oil. I cut a lemon in two, stuffed half of it into the cavity and squeezed the juice from the other half over the top. Then I put the chicken in the oven and hoped for the best. It was a little dry, under-seasoned and not quite as crispy as I'd hoped it would be. But that first attempt was a game-changer. My family ate it with potatoes — roasted right in the same pan — and a salad. Everyone loved it. At the time, it was the most grown-up dinner I'd ever made. Even now, I still feel a sense of pride and accomplishment whenever I take a lovely, golden chicken out of the oven and serve it to my family. In any dinner-themed cookbook, you're bound to find a recipe for roasted chicken. And with good reason: It's a classic. The best part? It works for just about any occasion. You can cook one for a big holiday get-together or a regular old family dinner. My culinary idol, Nigella Lawson, summed it up best in her book, Feast: "It's less a recipe than a blueprint for life. There are few things that can't be made better by a chicken roasting in the oven." I probably cook this dish every other week during the cold-weather months. I have tried at least a dozen methods, but the one that follows is my favorite. It uses a lemon, my one non-negotiable roasted-chicken ingredient, and has a surprising, Vermonty twist. Remove any organs from the chicken's cavity. Rinse the chicken in cold water and pat dry with a paper towel. 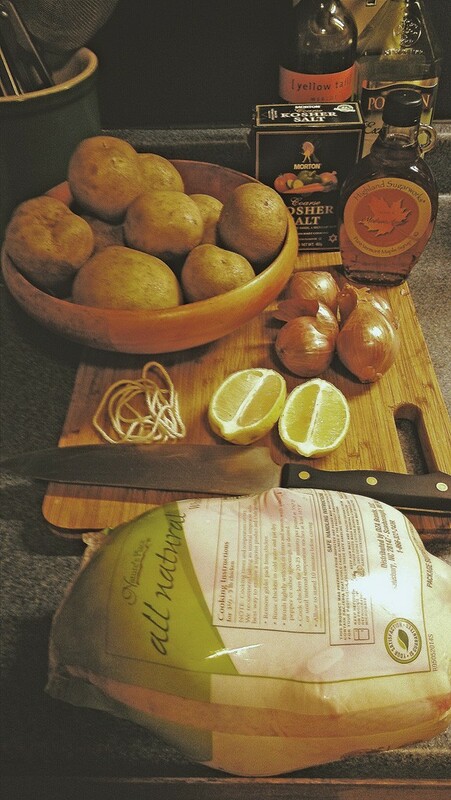 Put both lemon halves and two shallots inside the cavity and tie the chicken's legs together with kitchen string. Rub the chicken all over with olive oil and season generously with salt and pepper. 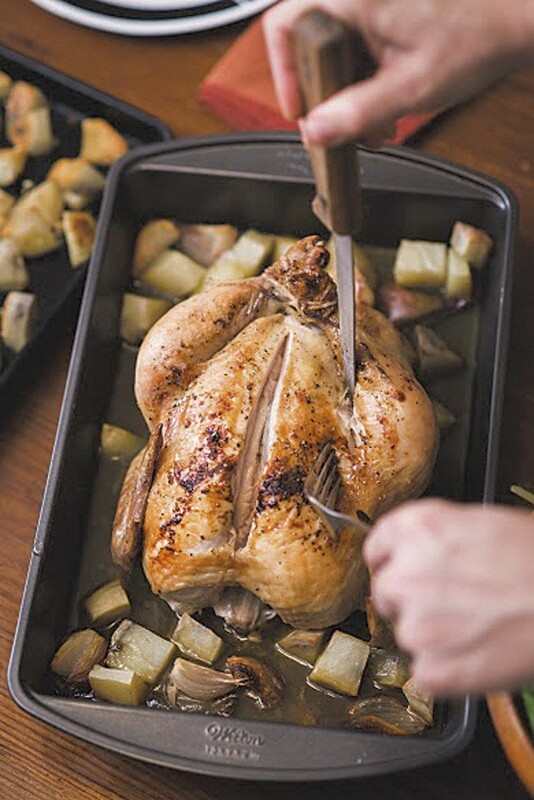 Place the chicken in the center of a roasting pan, and scatter the potatoes and remaining shallots around it, then drizzle a little olive oil over them. Roast for 30 minutes, then take it out and pour the maple syrup and the 1/4 cup olive oil over the top. Lower the oven temp to 375 degrees, and continue to roast for another 45-50 minutes. Use an instant-read thermometer to check the temperature of the bird. Insert it into a thigh, making sure not to touch bone. When you get a reading of 165 degrees, the chicken is done. Feel free to give it an extra few minutes if you want the color darker or the skin a bit crispier (I usually do!). Take it out of the oven and let it rest for at least 10 minutes before carving.